With almost 30 years’ experience under their belt, 1&1 web hosting are currently one of the most established hosting brands in the industry. Founded in Germany in 1988, their European base makes them a much more attractive option for those us in the UK, whilst their focus on high-tech hosting at low costs makes them ideal for advanced users looking for a plan that’s a cut above most newcomer-friendly solutions. In this review, I’ll be discussing the pros and cons of those plans, focusing on the Basic package. 1&1 do a lot of things differently, and are one of the few major players in the hosting industry that still offer scalable, tiered hosting plans rather than the kind of all-inclusive hosting that many leading brands are moving towards. In my opinion, it’s the best value-for-money solution offered by 1&1. 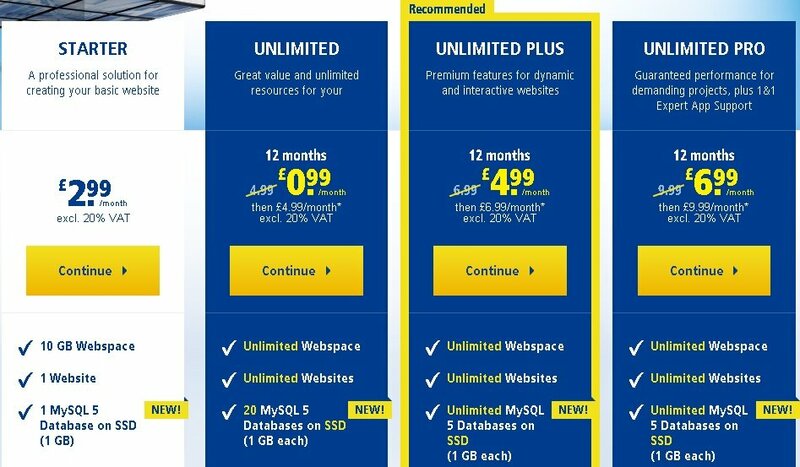 The cost of this particular package starts at a rock bottom price of just £0.99p for a 12 month term, after which it increases to the regular hosting fee of £4.99 per month. As you’ll see above, this regular fee isn’t actually the cheapest offered by 1&1. That honour goes to their fixed-price starter plan, which remains at £2.99 no matter how long you stay with the company. Whilst this may seem like it would work out cheaper once that 12 month term expires, the limited amount of features and resources on offer do mean this is only really suitable for those of you looking to create a single, small website. 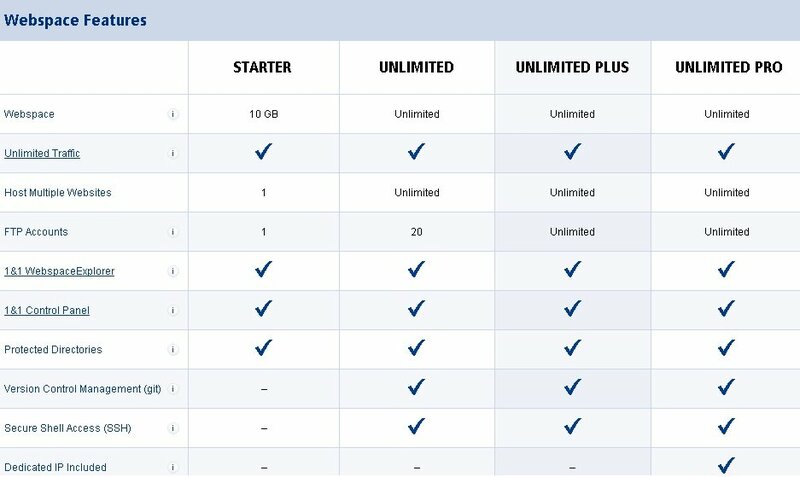 Compare this with the unlimited bandwidth, storage and ability to create as many websites as you like on your plan, and you’ll see why I think Basic Unlimited is the better option. That’s before I even mention that £0.99p is by far the lowest cost for first term hosting I’ve come across anywhere on the web. There’s also a free domain name included. Let’s head on to the next section to learn more about that together. Like the majority of hosting providers featured on UK Web Host Review, 1&1 bundle a free one-year’s domain registration in with their unlimited plans. This is another good reason to at least opt for the basic £0.99p / £4.99 package over the fixed price, £2.99 startup package, as the latter doesn’t include the free domain name. Your Basic package also supports unlimited websites, and as such, you can use as many add-on and forwarding domains as you choose to. If you do need to buy extra domain names, I highly recommend checking out 1&1’s domain registrar service, as their currently one of the cheapest on the block, with many .coms and other Top Level Domains going for as little as £0.99p. Another benefit here of course, is that if you’re using these additional domains with your basic plan, you’ll find it much easier to configure them for your websites than you would if you had to point a 1&1 domain to a website hosted elsewhere. Apart from the welcome fact that they’re European rather than US based, the other major difference between 1&1 and their nearest rivals seems to be their target audience. Whilst a number of companies (iPage and SiteGround spring immediately to mind) pitch their services predominantly at beginners and those looking for a quick, simple and hassle-free way to build and run a website, 1&1 do no such thing. Sure, they don’t outright claim that they’re targeting intermediate and advanced users, but spend any amount of time with their unlimited hosting plans and this quickly becomes apparent. From the use of their own control panel which deviates from the standard models employed by cPanel and vDeck to the way the company’s tech support reps assume a high level of technical knowledge on the part of their customers, right the way down to the focus on high performance technology over simple-to-use tools, this is one far more suited to those with some previous experience of working with a hosting company rather than those looking to create a website for the first time. 1&1’s unlimited shared hosting plan may have its issues, but thankfully, performance and reliability aren’t one of them. As we all know, consistently high levels of uptime from web servers which deliver your site to browsers with optimum speed are vital to the success of any web project, and this is something the company use as one of their biggest selling points. The company employs geo-redundancy technology, which involves running your shared hosting lan simultaneously from two separate data centres. This means that if there’s a problem with one, the other one automatically kicks in, eliminating most common downtime issues and keeping 1&1 hosted sites up and online more consistently than many of its competitors. The company also utilises a powerful Content Delivery Network (CDN). With this, when a visitor drops by your website, pages are loaded from the closest data centre to them, guaranteeing lightning fast loading speeds and overall enhanced performance. Whatever issues 1&1 may have elsewhere, if you’re currently looking for a new host because you’re fed up with the amount of downtime and slow loading speeds provided by your current host, this one should definitly be one to consider. As I mentioned when discussing 1&1’s ease of use, this is a company far better suited for intermediate to advanced users rather than complete beginners, and the website building tools available is one of the main reasons why. The company’s shared hosting plans focus primarily on one-click installation of Content Management Systems like WordPress, Joomla, and Drupal, as well as add-ons, interaction tools and other web purpose-specific tools such as the Moodle e-learning platform and wiki creator, MediaWiki. Whilst these are easy enough to install and start using, they do require a learning curve that is at least a little steeper than customising a template with the kind of drag-and-drop website builders which 1&1 unfortunately don’t bundle in with their unlimited plans. That’s not to say there isn’t one available. 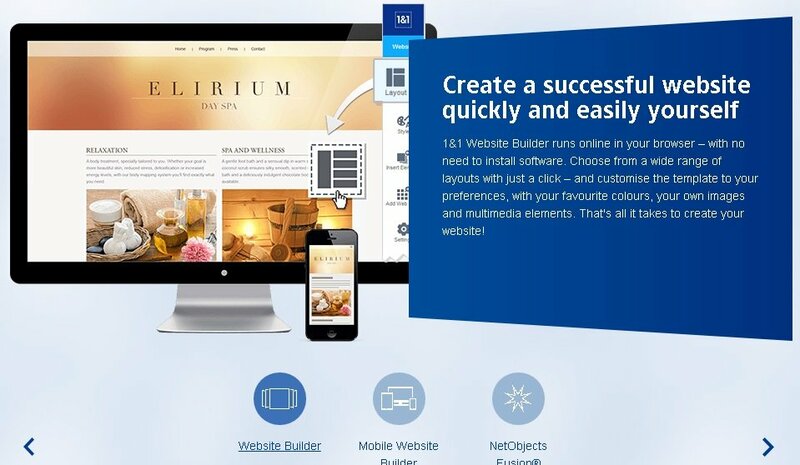 An drag-and-drop website builder known as 1&1 MyWebsite is available, but this is in it’s own separate package with first-term prices ranging from £0.99p per month for a basic, entry-level solution, to the all-encompassing £14.99 per month Premium plan which is better suited for online stores and other large websites. Sadly, the long-term, regular prices for these packages are more expensive than a basic hosting package, with the former being charged at £6.99 after the first term and the former setting you back a cool £29.99 per month after the 12 month contract term expires. If you’re still interested in this solution, I’d actually recommend the same plan level as with hosting. 1&1 MyWebsite Basic will set you back £4.99 for the first 12 months and £9.99 thereafter. Again, whilst this is certainly more expensive than an unlimited hosting plan from the company, it does come with a permanently-free domain name (the starter plan only includes a free domain for the first 12 months), unmetered bandwidth and storage, a basic email package, and over 10,000 well-designed templates for you to customise. There’s also a vast stock photo library (and when I say vast, I mean several million images) and various add-on tools for site management and user interaction. Unlike hosting, 1&1 MyWebsite does come with a free 30 day trial, so you can at least give it a go before deciding whether it’s worth sticking with it, or looking for a cheaper alternative such as iPage. Like free domain names and website builders, marketing bundles are fairly standard features of many shared hosting packages, added in by companies eager to provide the best possible value for money, and thus attract the most customers. 1&1 are no exception, though as with most things they do, their approach to marketing is somewhat different. 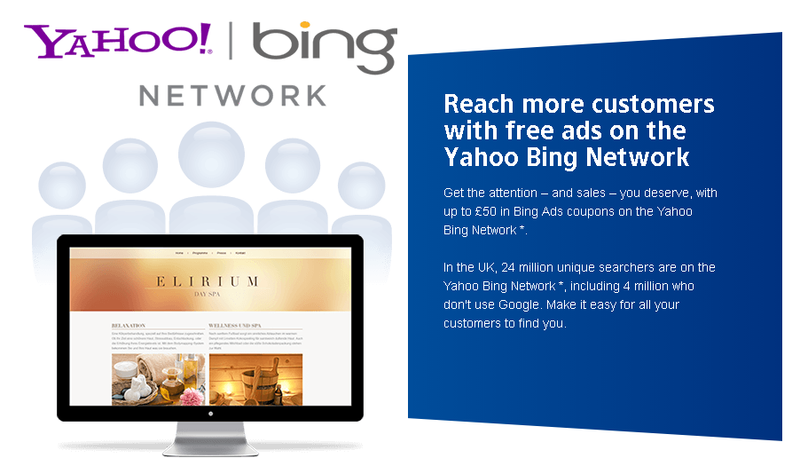 The usual industry-standard marketing suite includes Google AdWord vouchers, Bing/Yahoo! network advertising vouchers, and perhaps a few guides and tutorials. On the downside, 1&1 don’t offer Google ad credits at all, and their Yahoo!/Bing offer is only £50, half the amount offered by other leading brands. On the upside, there’s a lot of other useful tools available, including a dedicated email marketing tool suitable for sending mail to upto 100 accounts, Adwords campaign managers, SEO support and site analytics which -contrary to the rest of 1&1’s advanced functions- are actually much easier to follow than the increasingly complex world of Google Analytics. As I’ve said in other reviews, I wouldn’t make the quantity of marketing tools a key deciding factor when it comes to choosing a new hosting company, but the amount of advertising credits and other tools are certainly worth considering when weighing up the pros and cons of an individual hosting plan like 1&1 Basic Unlimited. If you’re planning to launch an online store with 1&1, I’d recommend avoiding the Basic plan altogether and opting instead for the top level Unlimited Pro plan, which is currently priced at £6.99 for 12 months and £9.99 thereafter. Though this is undoubtedly frustrating -especially if you’re on a limited budget- eserving powerful eCommerce features for the most expensive package is a fairly common practice among hosting companies that still deliver tiered plans, so it’s not something I’m too surprised to see. Nor is it something I’m going to criticise when you consider that the Unlimited Pro package does represent good value for money compared to the premium level plans offered by other leading web hosts like HostGator. With this, you’ll have access not only shopping cart installation, one-click set-up of popular online store builders like Magento and PretaShop and PayPal support, but also vital eCommerce tools like SSL Certificates and dedicated IP addresses, both of which are essential in keeping sensitive customer data safe and secure. If you’re fairly new to the world of eCommerce, I’d recommend forgetting about this package also and opting for the £9,99 eShop package. This utilises the previously mentioned drag-and-drop site builder with built-in eCommerce tools and over 100 professionally pre-designed templates that you can customise with no more difficulty than if you were using drag-and-drop to build a basic brochure site. Though the long-term cost of this is at least double that of the 1&1 Basic Plan, I’d recommend it for those of you who want to take advantage of the company’s excellent uptime and performance rates whilst avoiding the complications and required technical know-how to build an online store. As you’ll see above, 1&1 do offer the main basic channels of customer service through phone and email, and it’s good to note that these are available 24/7, a common trait of most top companies. I also have to give the brand some credit for their extensive library of FAQs, articles and tutorials, which pretty much cover 100% of the more common set-up and maintenance issues experienced with web hosting. Yet for everything 1&1 get right about customer service, there’s a number of things that I have to say are disappointing. In my experience, I’ve often found that live web chat support is the quickest, cheapest, and most efficient way of solving problems, eliminating both the time it takes to wait for a customer support rep to respond via email and the cost of picking up the phone. Despite this being a fairly standard feature among many leading companies, it sadly isn’t one 1&1 offer. Things get worse when you do get to speak to someone. I’ve used both email and phone support in the past, the latter when I had a genuine issue and the former soley for the purposes of writing an informed opinion in this review. In both cases, I found that the support staff were often not the best at explaining things in simple, non-technical terms. Sure, they were helpful enough, but for your time spent dealing with support to be really effective, I’ve found you need a certain level of technical knowledge that goes above and beyond that of first-time website owners. Again, this only confirms my opinion that for all the good things 1&1 do, they’re a much better option for advanced users rather than beginners. 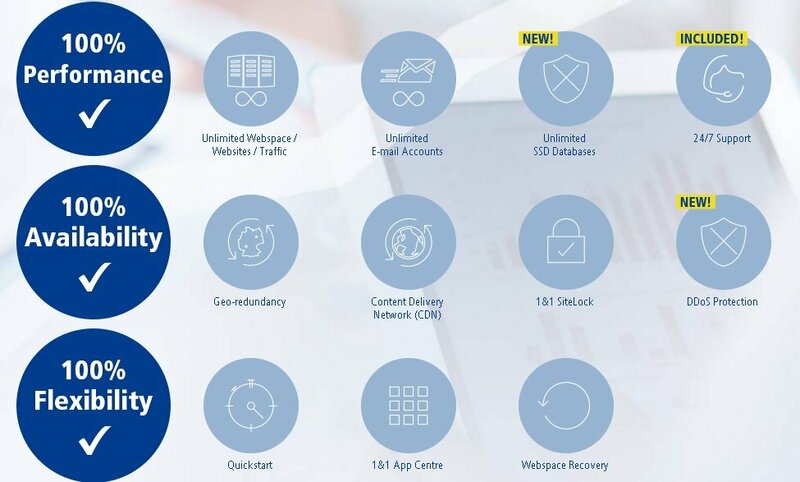 With some of the lowest costs and highest performance levels in the industry, 1&1’s Basic Unlimited shared hosting solution should certainly be a top contender for those with both previous experience in managing a website and at least some level of technical knowledge. Yet for those of you looking to build your first website, I’m afraid to say that this one might not be the best option for you. The company’s focus on high tech over simplicity, may be perfect for those aforementioned advanced users, but for beginners, it can present its own unique challenges. 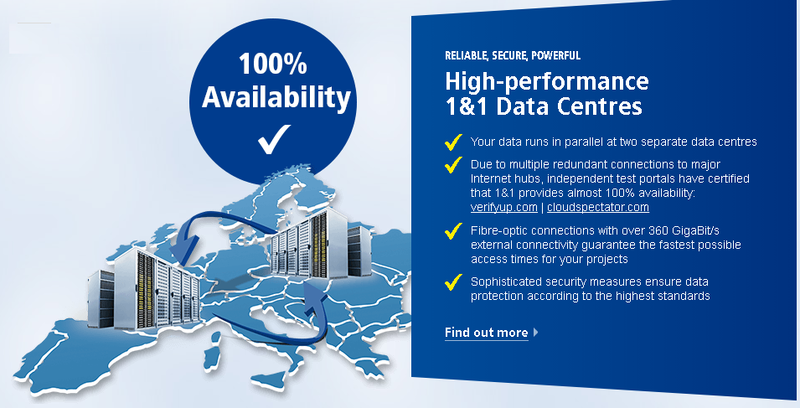 Still, if you’re up for the task, and if you’re looking to find a hosting solution that’s based closer to home rather than over in the United States, you certainly can’t go wrong with £0.99p for 12 months of exceptional uptime and powerful website performance.